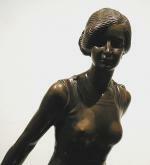 Art-deco fine detailed figure of a girl in a bathing costume was created by Austrian sculptor Gerg Leisek, born 1869. 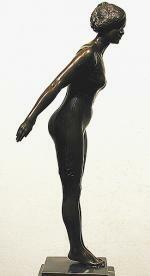 He studied at the Vienna Acaremy of Art under E.v.Hellmer and C.Zumbusch. His workes one can find all over Austria: sculptures for Buergerthetre (1900), City Hall of Floridsdorf (1902), Vienna University (1902), Monument of Kaiser Franz Josef I in Prachatitz (1903), Arnau and Ischl (1910). Inscription: signed Leisek on the bronze base.